Aviation Performance Solutions LLC (APS) announced today the delivery of the 2017 Upset Prevention & Recovery Training Scholarship to William Romualdo, an A320 captain and recent graduate of Embry-Riddle Aeronautical University. The annual scholarship awards a deserving pilot with the Professional Pilot Upset Training Course, which mitigates the risk of Loss of Control In-flight (LOC-I) by training pilots to recognize, prevent, and if necessary, recover from an airplane upset. 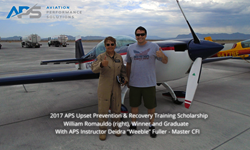 Aviation Performance Solutions LLC (APS), a global provider of Upset Prevention & Recovery Training (UPRT), is pleased to announce completion of the 2017 Upset Prevention and Recovery Training Scholarship course by William Romualdo, a recent graduate of Embry-Riddle Aeronautical University with a degree in Aeronautics. William Romualdo was born in São Paulo, Brazil, where he developed a passion for aviation at age 9, and from then on, never wavered in his goal to become a pilot. Having just completed his B.S. in Aeronautics, William already has a distinguished aviation career in which he served as a missionary pilot for African Inland Missions and went on to become a flight instructor and an A320 captain. William became keenly interested in the APS UPRT program after noting significant gaps in the standard pilot training, specifically for pilots of Airbus aircraft, in the area of upset recovery training. Every year, APS donates one Professional Pilot Upset Training Course, a $4300 value, to a deserving pilot currently in flight school or just starting their professional aviation career. The course provides comprehensive Upset Prevention and Recovery Training (UPRT), integrating academics and on-aircraft instruction to mitigate the risk of Loss of Control-Inflight (LOC-I). Because LOC-I is the number one cause of fatalities across all sectors of aviation, UPRT is critical for pilots to be fully prepared for any unexpected, time-critical flight situation that could occur in-flight. Properly delivered UPRT compliments licensing training by ensuring pilots have a deep understanding of upset causes – with critical focus on prevention – and are trained to proficiency in the often counterintuitive skills necessary to recover from a developed airplane upset. APS offers upset prevention & recovery training to all sectors of aviation: airline, military/government, corporate, owner/operator and flight schools.